The Railway Labor Act, more frequently referred to as the RLA, was enacted in 1926 as the joint work product of railway labor and management. It was amended in 1934, in 1936 when it was expanded to include airlines, in 1966, and, most recently, in 1981 when special bargaining dispute resolution procedures applicable to publicly owned and operated rail commuter carriers were added. The RLA is administered by the National Mediation Board (NMB), an independent Federal agency. 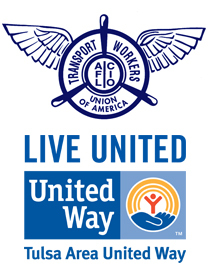 The purposes of the RLA are to avoid any interruption of interstate commerce by providing for the prompt disposition of disputes between carriers and their employees and to protect the right of employees to organize and bargain collectively. The RLA imposes a duty on carriers and employees to exert every reasonable effort to make and maintain collective bargaining agreements and to settle all disputes, whether arising out of the application of such agreements or otherwise. The RLA also provides mandatory dispute resolution procedures that preclude strikes over union representation and grievance disputes, and postpones the ability of either party to take action in bargaining disputes until it has completed the process outlined in the Act. The RLA’s procedures for resolving bargaining disputes, which are referred to by the courts as major disputes, are designed to facilitate negotiations, to narrow disputes, and to focus public opinion on the participants in order to pressure the parties to voluntarily reach an agreement. The NMB’s ability to hold the parties in mediation to force good faith negotiations and to assist the parties in reaching settlements, coupled with the status quo requirements of the RLA, are intended to incentivize the peaceful and prompt resolution of disputes. The NMB can time the release of the parties from mediation to coincide with a period when Congress is in session and positioned to address the dispute. PEBs also contribute to the settlement process. 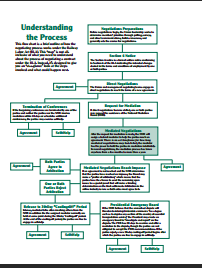 The various aspects of the bargaining process are outlined in additional detail below. Negotiations conducted by the carrier and union without the assistance of a mediator or other National Mediation Board (NMB) involvement. Generally, an impasse exists when progress is not being made in negotiations. Typically, the carrier or union invokes the mediation process after an impasse occurs. The carrier and union may file an application for mediation individually or jointly. Under certain circumstances, the NMB may invoke mediation on its own. Mediation refers to negotiations conducted with an NMB-appointed mediator after the parties have failed to reach an agreement in direct negotiations. 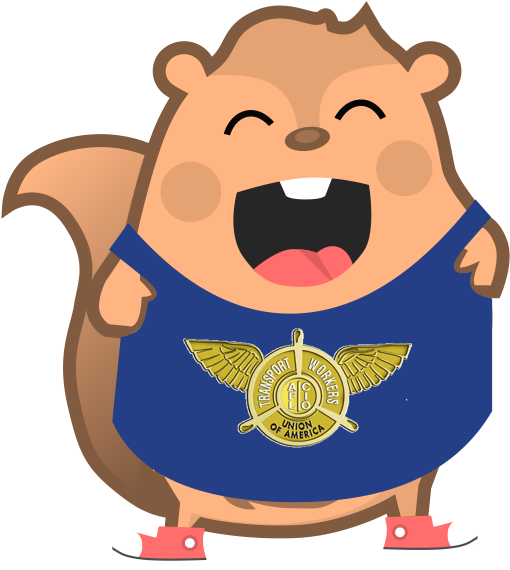 The NMB is an independent agency that performs a central role in facilitating harmonious labor-management relations within two of the nation’s key transportation modes:?the railroads and airlines. On the shelf, on ice or recessed are unofficial terms used to describe an NMB decision to postpone any additional mediatory efforts for a specific period of time while declining to release the parties. At this point, the self-help options available to a carrier and union are indefinitely frozen. The Railway Labor Act (RLA) is the federal statute governing collective bargaining, representation and grievance processing in the airline and railroad industries. Section 6 refers to the provision of the RLA obligating carriers and unions to provide timely notice of intended changes to rates of pay, rules and working conditions. 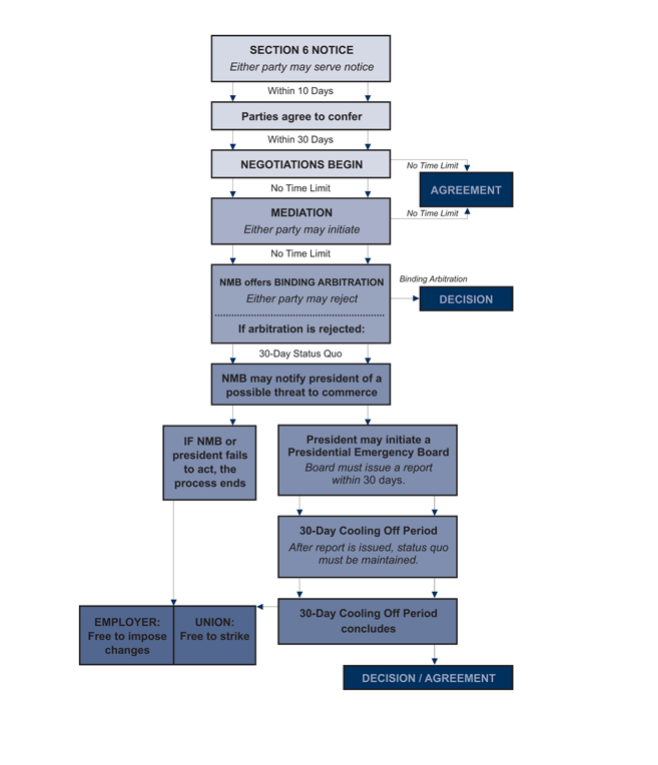 A Section 6 “Notice of Intended Change,” triggers the parties’ obligation to commence direct negotiations. the prompt and orderly resolution of disputes regarding the interpretation or application of existing agreements. The NMB is a federal agency created by the RLA to administer the Act and effectuate its purposes, including collective bargaining and representation disputes in the rail and air industries. The NMB mediates negotiations, assists with grievance resolution, and resolves representation disputes through employee elections. The NMB consists of three members appointed by the President of the United States and confirmed by the Senate to serve a three-year term. No more than two members of the NMB may be of the same political party. A member may continue to serve while a replacement appointment or reappointment is pending. The NMB also employs staff mediators and other specialists to assist it in its work. Mediation serves to foster the prompt and orderly resolution of collective bargaining disputes in the railroad and airline industries. These disputes, referred to as major disputes, involve the establishment of or changes to rates of pay, rules and working conditions. In its mediatory role, the Board may employ a variety of methods, including traditional mediation, interest-based problem solving or other types of facilitation. NMB mediators often play an active role in the negotiation process, including determining the frequency, times, dates and locations for negotiations. Historically, some 97 percent of all NMB mediation cases have been successfully resolved without interruption to public service. Since 1980, only slightly more than one percent of cases have involved a service disruption. How does mediation get started under the RLA? The NMB employs several staff mediators who are selected for their experience and knowledge in labor-management relations and dispute resolution. The Board selects a mediator for a particular case based on mediator availability, knowledge and experience. How long does the NMB keep parties in mediation? There is no rule for how long mediation will last in any particular case. The Board has the discretion to decide whether and when to terminate mediation. Some mediation cases have lasted several weeks while others have lasted several years. How does a mediator help parties reach agreement? Mediators cannot require the parties to reach an agreement; however, skilled mediators often suggest practical solutions to difficult issues. They have been trained in techniques that serve to engage the parties and to foster compromise, and ultimately, progress in bargaining. The NMB supervises the mediator and retains the authority to decide when and if mediation should be terminated thereby releasing the parties to engage in self-help measures. The Board uses its authority to release or to delay the release as a form of pressure on both sides to induce movement toward an agreement. Are the carrier and union legally obligated to reach an agreement in direct negotiations or mediation? The RLA requires carriers and unions to “exert every reasonable effort to make and maintain agreements concerning rates of pay, rules, and working conditions.” However, this provision does not compel either party to accept any particular proposal, and the courts generally do not question the parties’ bargaining positions. Who can decide to end mediation? The mediator, alone, cannot end mediation. Rather, the Board will make a determination based upon the mediator’s report, and sometimes, based on discussion between Board members and the negotiating parties. Does the NMB terminate mediation if one of the parties appears to be using mediation as a means of moving closer to the cooling off period and/or the ability to engage in self-help? The NMB does not have the jurisdiction to decide whether a party has engaged in good-faith bargaining. Such determinations are reserved to the federal courts. However, the Board, preferring not to reward bargaining strategies undertaken to avoid agreement, may request the mediator slow the pace of mediation if he or she observes one or both parties attempting to rush the process rather than genuinely working to reach agreement. It should be noted that slow-paced mediation does not necessarily indicate the mediator has observed bad-faith bargaining by either party. How much notice does the NMB provide prior to ending mediation? When the mediator determines mediation should not continue, he or she temporarily suspends mediation so he or she can report to the Board. At that time, a Board member may enter mediated negotiations in a final effort to convince the parties to continue talks rather than to release them into the cooling-off period. However, if progress cannot be made, either the mediator or NMB member may advise the parties that mediation will soon conclude. The Board also has the power to recess negotiations as an alternative to release. What does the NMB do to end mediation? The RLA states that if the Board’s “efforts to bring about an amicable settlement through mediation shall be unsuccessful,” the Board will attempt to “induce the parties to submit their controversy to arbitration.” In practice, the Board extends a proffer of arbitration, which would put the parties’ outstanding contractual issues before an arbitrator for resolution. Can the Board place mediated negotiations on the shelf, on ice or recess them rather than releasing the parties? Yes. The Board has the authority to slow mediation down or even suspend it as way of putting pressure on the parties to reexamine their positions and to work toward an agreement. When the Board acts in this manner, a release from mediation, a pre-condition for exerting economic power to secure changes in rates of pay, rules and working conditions, is not available to the parties until and unless the NMB later releases the parties. prohibited from changing rates of pay, rules and working conditions except as provided for in agreements. Unions are prohibited from engaging in any form of self-help against the carrier for the purpose affecting negotiations. The question of whether the carrier’s obligation to refrain from making changes to the status quo during negotiations over an initial agreement is unsettled in the courts. What type of conduct does the status quo obligation prohibit? Generally, any conduct designed to cause economic injury to the other is prohibited, including carrier-initiated changes to rates of pay, rules and working conditions, and employee sick outs, maintenance write-up campaigns and strikes. What type of conduct is permissible during the status quo period? Either party has the right to engage in lawful activity designed to educate and inform its constituency or the public of its position. A good example of permissible conduct is informational picketing. If either party refuses to arbitrate the dispute, the Board’s mediation services officially end and the 30-day countdown to self-help, more commonly referred to as the cooling off period, begins. The Board will issue a notice to this effect delineating the precise moment when the status quo obligation terminates. If neither party responds to the proffer of arbitration, the countdown does not start and the mediator is no longer obligated to “exert every reasonable effort” to assist the parties in reaching agreement; however, the NMB may attempt to move the process forward from time to time. If, at a later date, either party officially rejects the proffer of arbitration, the 30-day countdown will begin. Conversely, if the parties accept the proffer, arbitration will commence. If one party accepts arbitration, but the other does not respond, the countdown does not begin. If both parties accept arbitration, the open or disputed issues will be submitted to a board of arbitrators selected under in accordance with procedures established by the RLA. Is there any obligation to accept the Board’s proffer of arbitration? No. The Act does not compel the parties to submit their negotiation disputes to arbitration. If the parties accept the proffer of arbitration, what is arbitrated? The parties retain sole discretion regarding what issues to arbitrate. If, however, the parties cannot agree on the issues, they may be considered to have rejected the proffer of arbitration. The RLA requires the parties to agree in writing on the precise issues to be submitted to arbitration for decision. Once an arbitration agreement has been signed, it may not be unilaterally modified or revoked. The Board of Arbitration will conduct interest arbitration although final-offer arbitration is permissible if both parties agree. If either party refuses the proffer of arbitration, the NMB must immediately notify both parties that mediation has failed and for 30 days thereafter no changes may be made to rates of pay, rules, working conditions or established practices. The written notice is known as a “release” from mediation. The 30-day period following the release is known as the 30-day cooling off period. During the cooling off period, the Board may actively encourage the parties to meet and attempt to resolve their dispute through negotiations. At the end of the 30-day cooling off period, the parties may engage in self-help, subject to the establishment of a Presidential Emergency Board. In rare situations, when a dispute “threaten[s] substantially to interrupt interstate commerce to a degree such as to deprive any section of the country essential transportation service,” the NMB may recommend to the president of the United States that he or she create a Presidential Emergency Board (PEB) to investigate the dispute and make recommendations for resolution. A PEB, once convened, temporarily extends the obligation to maintain the status quo. More specifically, creation of a PEB stops a strike, lockout, or other form of self-help, generally, for 60 days. The emergency board has 30 days to issue a report, which typically includes recommendations for settling the dispute; this period may be extended by the president. After the PEB reports to the president, the parties are released into another 30-day cooling off period to consider the PEB’s recommendations as potential basis for an agreement. If an agreement cannot be reached by the conclusion of the second cooling-off period, the parties are free to engage in self-help, including strikes, lock outs, and unilateral changes in terms and conditions of employment absent legislative action by Congress to the contrary.